wine-growing region of the western Cape. Stellenbosch University is an internationally recognised university with about 150 departments in 10 faculties and more than 40 research (and other) institutions. A century-long tradition of quality teaching and research has ensured Stellenbosch University’s place among the finest academic institutions in Africa. The history of the University dates back to the opening of the Stellenbosch Gymnasium in 1866 and the establishment of the Arts Department, which became the Stellenbosch College in 1881. In 1887, the jubilee year of Queen Victoria’s reign, this name was changed to the Victoria College, which acquired university status in 1918 to become Stellenbosch University. 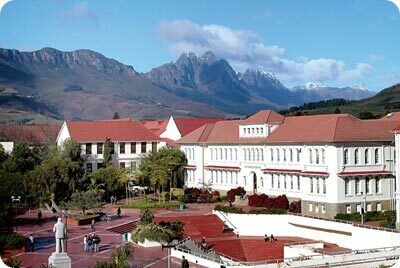 Stellenbosch is a university town with a population of about 90 000, excluding students. Located 50 kilometres from Cape Town, the town is set on the banks of a river in the wine-growing region and is encircled by majestic mountains. For swimming, surfing and other watersports, superb beaches can be reached in half an hour’s travel. Teaching at Stellenbosch University is provided in 10 faculties situated on four campuses: Stellenbosch, Tygerberg, Bellville Park and Saldanha. Stellenbosch University is a predominantly Afrikaans university. The medium of tuition for undergraduate and several honours courses at Stellenbosch University is Afrikaans. Students from other countries who do not have a working knowledge of Afrikaans may find it difficult to follow the lectures. Class notes and discussions are also not necessarily in English. However, students are at liberty to write their assignments, tests and examinations in English. At postgraduate level the language of tuition is determined by the composition of the class. The majority of advanced postgraduate courses are conducted in English. Admission is granted on the grounds of academic considerations only. Undergraduates should have matriculation exemption and a minimum average percentage. Some courses require minimum pass marks in specific matriculation subjects. International candidates are required to submit certified copies of all academic qualifications at admission. The faculties on the main campus include: Arts and Social Sciences Science Education Agricultural and Forestry Sciences Law Theology Economic and Management Sciences Engineering. The faculties not situated on the main campus are Military Science Health Sciences. The University houses an extensive library collection catalogued on a computerised database. The state-of-the-art Conservatoire with its two concert halls features regular concerts. The Langenhoven Students’ Centre houses the Students’ Representative Council, a food court, a shopping mall, an advice office and all student societies. The Division for Academic Support Services provides career counselling, a crisis service and academic development programmes. Two sports stadiums, two large swimming pools, acres of playing fields and a high-tech gymnasium encourage more than 30 competitive and recreational sports. University residences house some 6 000 students. Partially furnished university apartments close to the central campus are available for international students. Certain categories of international students may, however, qualify for assistance subject to the regulations of the Bursaries and Loans Office. The University gives financial aid to postgraduate international students from SADC countries. Candidates of high academic standing qualify for support after their first year of residence on campus. University life is interwoven with the atmosphere of the town of Stellenbosch. The active campus is organised around more than 50 cultural, sporting, religious and political clubs and societies.